TEVITA Pangai Jr admits he can't afford career-threatening breakdowns with hamstring injuries as the Broncos powerhouse braces for forward fireworks with Cowboys destroyer Jason Taumalolo. On Tuesday Broncos coach Anthony Seibold pitchforked Pangai from the bench to a starting front-rower's role for Friday night's derby against North Queensland after prop Matt Lodge copped a two-match suspension. Pangai's promotion to replace Lodge puts him on a 228kg collision course with Tongan Test colleague Taumalolo, who will run on to Suncorp Stadium in supreme form after his 301-metre demolition of the Dragons last Saturday night. Taumalolo last year claimed Pangai had the muscle and mongrel to one day be better than him, and the 113kg Broncos brute gets the chance to make a statement in the latest instalment of the epic Broncos-Cowboys derby. 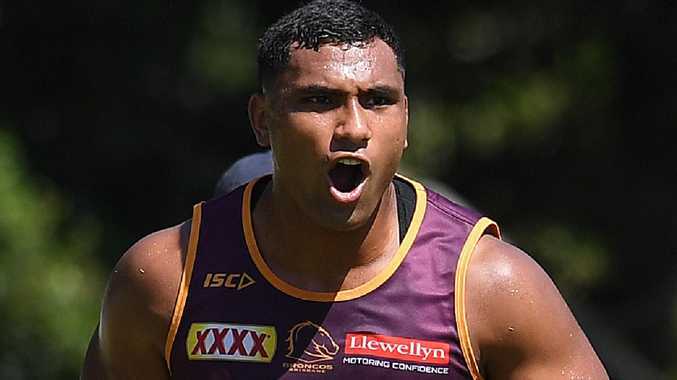 Pangai is Brisbane's most explosive forward but while Taumalolo rarely misses games, the 23-year-old has spent the past year waging a frustrating battle with hamstring injuries. Not even an intensive off-season regimen trying to strengthen his hamstrings could prevent the minor strain in a trial against Wynnum which left Pangai racing the clock to start the season against Melbourne last Thursday night. As he prepares to trade midfield blows with Taumalolo, Pangai admits he must get more professional if he wants to enjoy the sustained success that saw his Cowboys rival win the Dally M Medal three years ago. "It's been frustrating with my hamstrings," Pangai said. "It's a credit to the coaching staff and the new medical staff we have here that they got me back quickly (for the Storm game), but I've had to work harder as well. "When I was younger, I used to walk into training and be the last one ready. Now I come in an hour-and-a-half early and stretch and do all the pre-hab stuff to make sure my body is in good shape. "It's part of growing up and being a professional. "To get paid, I need to stay on the field. I have to make sure I'm not injured all the time. "I can't be a yoyo in and out of the team, so I'm putting in the extra work to make sure I'm fit and ready to go." Pangai was not the only change to Brisbane's starting pack for the Cowboys derby, with Seibold relegating Jaydn Su'A to the bench, opening the door for David Fifita to start on the right edge in the back row. Broncos recruit Shaun Fensom will face his former Cowboys club on a bench also featuring Su'A, Tom Flegler and Kotoni Staggs, who will replace James Roberts (back) at right centre if "The Jet" fails a fitness test. Pangai is renowned for his tackle-busting brilliance but Seibold said last week he didn't expect flashy plays from the hard-running Tongan. "I just need to do my job for the team," he said. "I don't need to do anything out of the ordinary. I play my best when I'm doing the little things right."